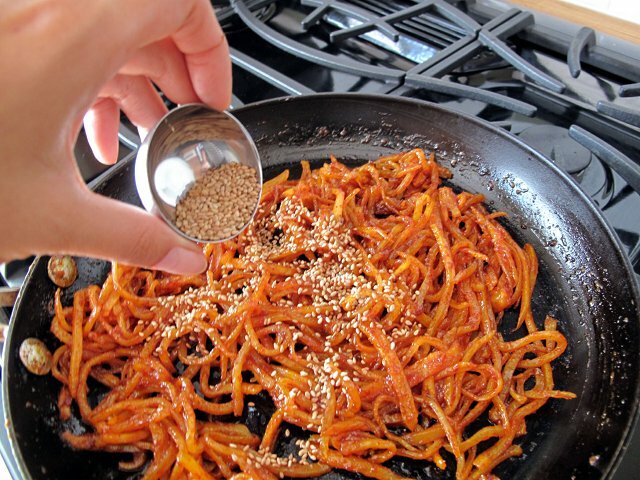 A staple side dish in most Korean kitchens and lunchboxes. Takes less than 5 minutes to make and will stay good for a long time. 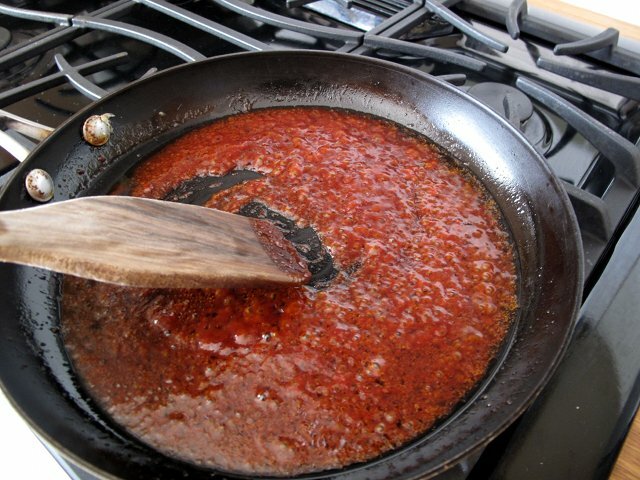 Adjust the amount of red chili paste and sugar depending on how spicy and sweet you like it. 1. 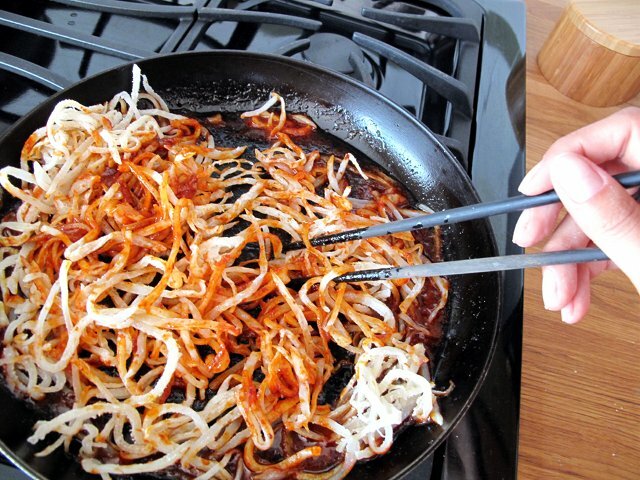 Mix the oil, red chili paste, soy sauce, rice wine, cooking syrup, and plum extract in a frying pan and bring to simmer on low. 2. Add the cuttlefish strips and mix until everything is evenly covered. Let it heat for another couple minutes or so. 3. 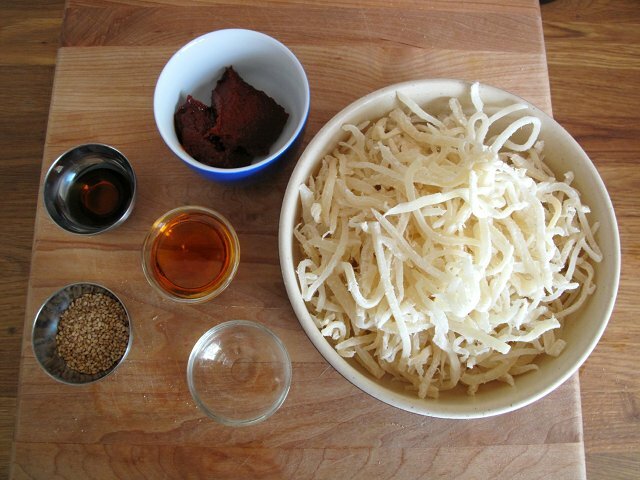 Add sesame oil and sesame seeds and mix around. And you're finished, literally under 5 minutes! It's good warm or cold. I love when my mom makes this, and now I can too! 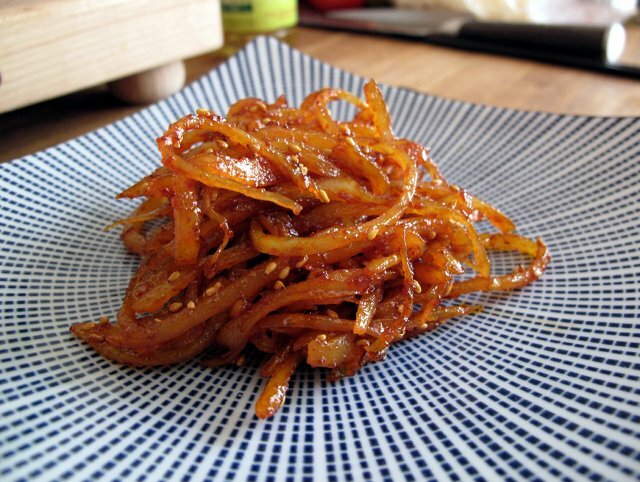 omg, this is one of my favorite side dishes. just give me a bowl of rice and I can eat this for weeks. This is one of my ABSOLUTE FAVORITE dishes. I like your blog. I'm a non-Korean living in Koreatown, and I've grown to like various Korean foods. But I still am very confused by much of it. A trip to Assi Market is wondrous and perplexing. Thank you for helping me understand a bit more. YUM YUM, who wouldn't want this!? Your recipes are so tantalizing! I'm just beginning to explore Korean food and am looking forward to attempting a few dishes at home. Thanks for having shown us which kimchee you recommend in an earlier post; could you also show us which red chili paste brand(s) you like to use? Thanks! What lovely blog you have ! I'm not from Korea but I really enjoy to eat and cook this kind of food. Thanks for sharing your culinary history. wow, I love dried cuttlefish but have only had it out of the bag so to speak... this sounds awesome! Very awesome blog! Actually, my friend is always cooking this for me whenever I go to his house. This dish is really delicious and you can really taste every ingredients of it.